I’ve wanted a 338 edge since Shawn Carlock first designed it many years ago. The 7mm rem mag or 300 win mag would work but wanted something with a little more grunt for way out there and just to be a little different. I reload for everything anyway and it makes sense getting the most out of it. 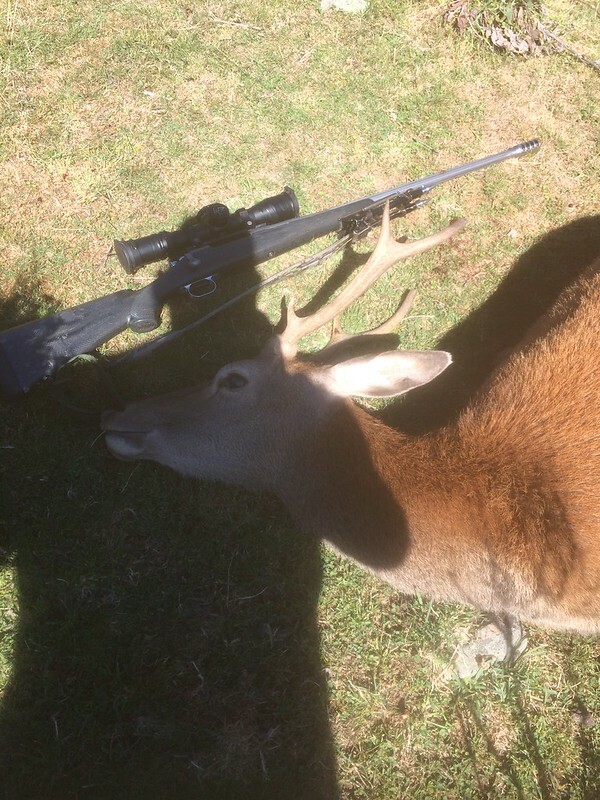 I scored a good second hand 338 edge the end of last year and quickly got it scoped up with my old 4-16x42 ATACR off my Sako 270win. Next was to sort some reloads which was easy work with a few days at the range testing chrony speeds and accuracy on paper and steel out to 790m with a 15 degree incline. Would of liked to test farther but wind has been to strong. It’s a pussycat to shoot with the muzzle break and you certainly feel the concussion of 93gr of powder in the boom, ear plugs a definitely a must. I swapped out the factory trigger for one of @camo wsm TriggerTech triggers which is crisp and smooth. The only thing I’d change is get a McMillan A3 or A4 stock to replace the hunters edge as all my shooting is prone but it works. Anyhow the other week I went to one of my old favourite spots for a overnighter, mountain bike as far as I could go and walk as far as needed where I could see across a big scrubby gully and over at a few open scrub faces in other directions from the same overwatch position with a shootable 300m to 1300m distances. The low cloud was rolling in and out on the last hour and a half of light, constantly scanning for deer with no luck till the last 20 minutes of light a 10 point stag was beded down on a little terrace on a spur. The Geovid range the stag at 671m and gave me the MOA drop, set the rifle up and dialed the scope turret then walked the hound dog back to the tent 60m away and signaled him to stay then I snuck back to my shooting position reranged the stag to confirm then yelled at the stag to get him to stand up as he did for a full broadside shot held 1.5 MOA for the wind and boomfaa thump on the stag wobbled walk a couple of paces and rolled of the terrace. A silent yeehaa to myself with the first deer down with the 338. Packed my gear up and back to the dog and tent for tea and call it a day, next morning we retrieved the stag and quick bone out session and go. Another roar recon trip a few days ago another area to cover. The 338 strapped to the pack for a day of rock hopping river and stream crossings just to get into a good area with good longer range shots possible. We turned down a few deer (25) that I could of easily shot with the 300 blackout and the dog wasn’t impressed but there’s no way I’m going to use a muzzle braked 338 with a dog so close. In the evening we set up camp high on the hill top in another overwatch position over looking all 4 points of the compass. Over 100 deer spotted that evening and chose a nice fat 8 point rubbishy small head for the menu. 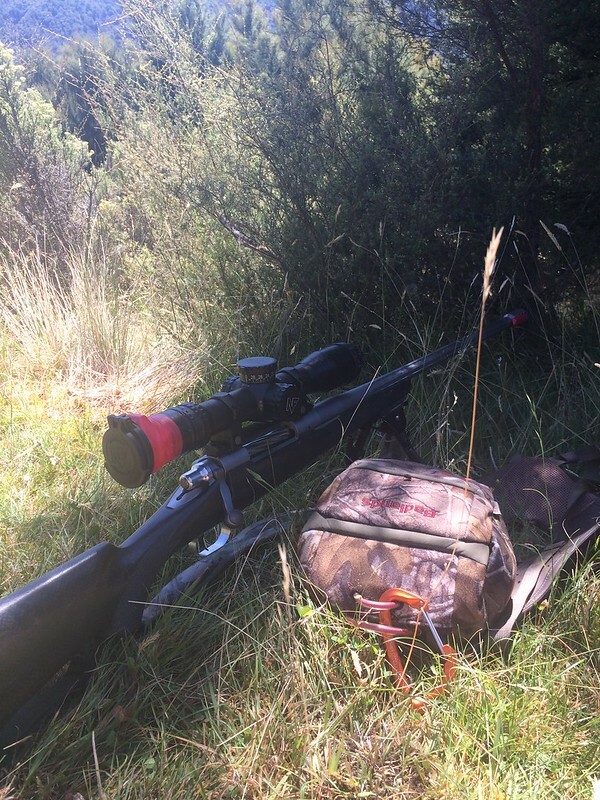 Range 668m, setup rifle, dial up scope turret, hold 2 MOA wind, walk dog back to camp 50m-60m away, rechecked everything, earplugs in, dry fire for good form, load a single round 300gr Berger elite hunter @ 2865fps, 2 MOA wind hold ready steady fire boomfaa another solid hit with the stag collapsing on the ground. The other other deer weren’t even fazed at the shot but just looking at there mate stone dead still not even twitching and carried on feeling. So I lined up the next rubbishy 6 pointer stag ranged and dialed him up and fed another round and down he went too. 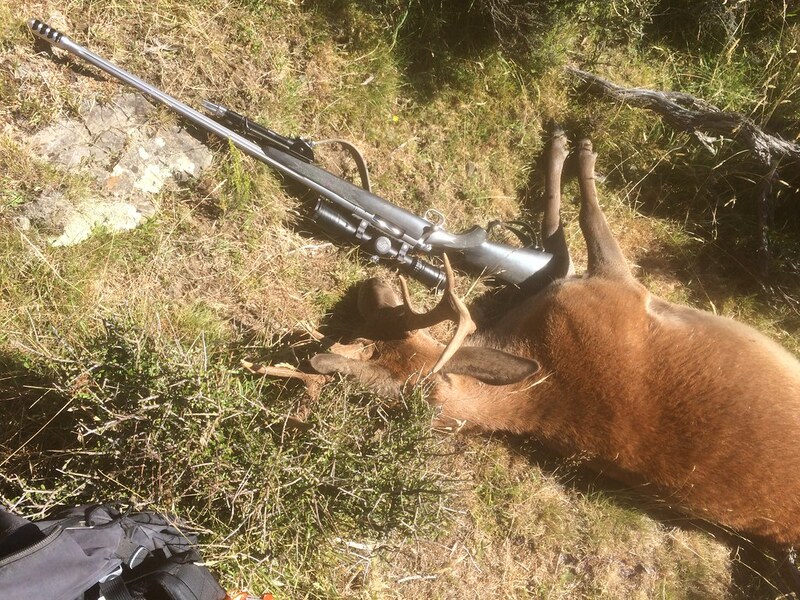 The following day knocked over a few goats at various distances and shot two more deer that evening a hind at 780m which trotted off 50m before collapsing ( bad wind call on my part ) and another bangflop at 925m that I had to use Ballistic app as the Geovids only give the drops to 800m. Five deer down in two trips I’m stoked and really need to take more photos or bring someone in with me that has a good camera for videos. The dog made easy recovery of the animals. Killing power of theses big 338 magnums is wicked and way more knock down than the 300wsm I had in the past. But if my shot placement is a little off it’s still doing a lot of damage for easier tracking if it comes to that. Looking forward to using it on a bull tahr in the future. As big, loud, powerful and reach way out there it is, I still prefer watching the dog working the wind, scenting the ground and using the sub sonic 300 blackout culling every goat in its range and drop the odd deer in silence. A stag recovered next morning still frozen from the southerly the next morning. This stag had a fist size hole on the exit side. Broke another tenebraex scope cap hence the red tape I’m bloody hard on gear pushing through the bush onto the tops. Nathan F, Shootm, outdoorlad and 16 others like this. I’ve been hankering for a 338 for a while myself, my thoughts are there’s no substitute for power! I picked up a 300 RUM as one came up cheap. Good on you for shooting a few deer in a place that obviously needs it. Yeah wanted to get into a few deer before the WARO thin them out. Some mates were ment to come into but couldn’t get the time off during the week. Mate, what a cool tool! Thanks for sharing your story and pics! Well Done , obviously those big 338's work well at long range. Nice one Tikka, gotta love the 338 edge, extremely easy to shoot and accuracy comes natural with that cal. I use mine 2-3 times a year hunting and find it to be phenomenal in regards to reliability.